Behold, the Miley Cyrusbot 5000! I can't hear this Jaeger's name without singing it to the tune of The Beatles' "Lady Madonna": "Titan Redeemer, Kaijus in the sea/Wonder when you're ever gonna close that breach." Titan Redeemer is probably the Uprising Jaeger who most stands out from the pack - but that's less about the design, and more about her distinctive weapon. 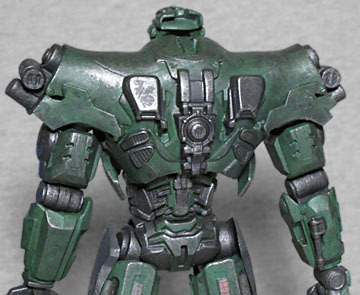 Titan is a dark green Jaeger, a color not seen on any of the others. The closest would be Cherno Alpha, and even that was a lighter, more desaturated shade - Titan is a much darker shade. Her head comes to two points on the chin, and the "eyes" are vertical yellow slits. Overall, it's a very insectoid look, like a robot grasshopper or something. The early concept art for this 'bot was pretty wild and knobby, with various budles of nodules sticking out on the elbows and shoulders; the final design has been extensively streamlined, to the point where the chest and shoulders are one nearly seamless smooth unit. It's an interesting contrast to all the other Jaegers, whose separate shoulder pads just kept getting bigger and bigger. There are (molded) gaps in the chest and thighs that allow the inner workings to be seen, and the feet are large, flat panels. 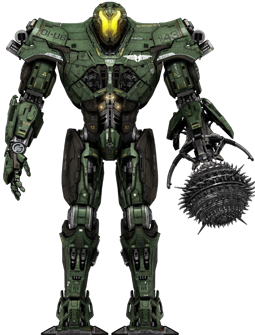 Compared to the complex mechanics of almost every other Jaeger in the movie - both movies - Titan Redeemer looks very simplistic; only Horizon Brave comes close. The big T-shaped chest and the flat feet were designed (in the world of the story) to compensate for the weight and torque of Titan Redeemer's primary weapon, the M-19 Morning Star mace. It's pretty much exactly what it sounds like: a gigantic spiked ball that replaces TR's left hand. Like we said, distinctive! The one here on the toy is ridiculously sharp - like, "we're not sure this thing could actually meet safety standards" sharp. 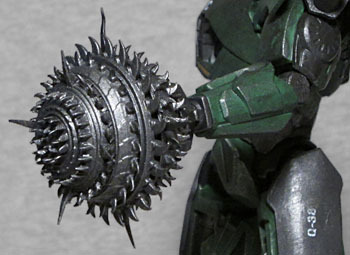 Presumably the only thing that allowed this to get approved is that the plastic used for the spikes is fairly thin and not incredibly hard, so the jabby little things will bend before they draw blood, but still. This is a toy that will hurt your fingers! Once again, the accessories are rather disappointing. This is the "Select" format release, which is meant to come with plenty of extras, but all we get is a single right fist. It doesn't even have the guns we see pop out at one point! It could have come with a hand, the hand's guns, an alternate left forearm with the prongs, and this forearm but with a "chain" for the ball to swing on. Instead? A fist. 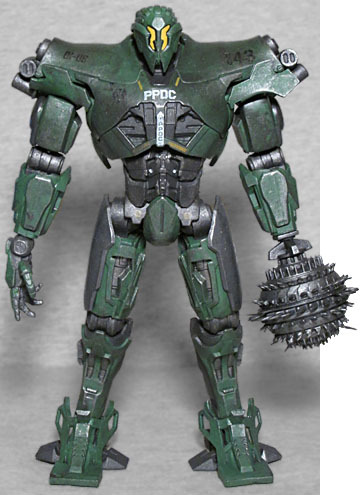 There's something else missing, too: Titan Redeemer is articulated like the other DST Pacific Rim toys, as she should be, but why on earth is her left arm not removable? Spoiler for the movie: when the Jagers get the crap kicked out of them and are mostly out of commission, Bracer Phoenix is retrofitted with Titan Redeemer's mace arm. So Bracer's right arm and Titan's left arm should both be removable, and we hould be able to swap them. Now, maybe that's possible using the boil 'n' pop method, but it should have been intentional play feature, not something limited to customizers. Titan Redeemer is a cool-looking Jaeger, but we can't help but feel that the toy is diminished somewhat by the limitations of how far ahead of the movie it had to go into production. If DST had known what was going to happen? They almost certainly would have included it in their toys.